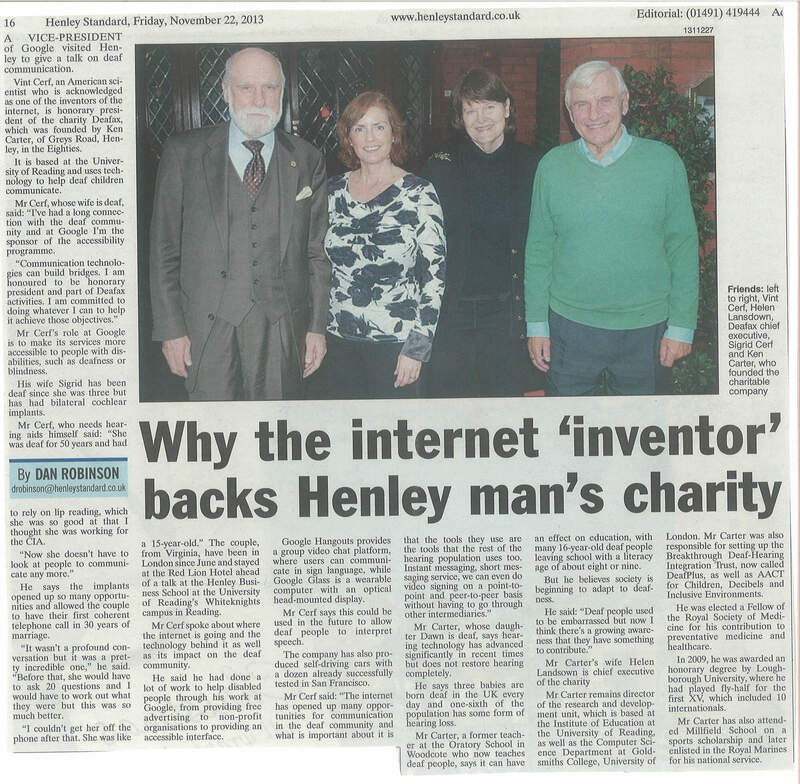 The following is an excerpt from the Henley Standard, Friday 22nd November 2013. It has been transcribed for accessibility. A Vice President of Google visited Henley to give a talk on deaf communication. Vint Cerf, an American scientist who is acknowledged as one of the inventors of the internet, is honorary president of the charity Deafax, which was founded by Ken Carter, of Greys Road, Henley, in the Eighties. It is based at the University of Reading and uses technology to help deaf children communicate. 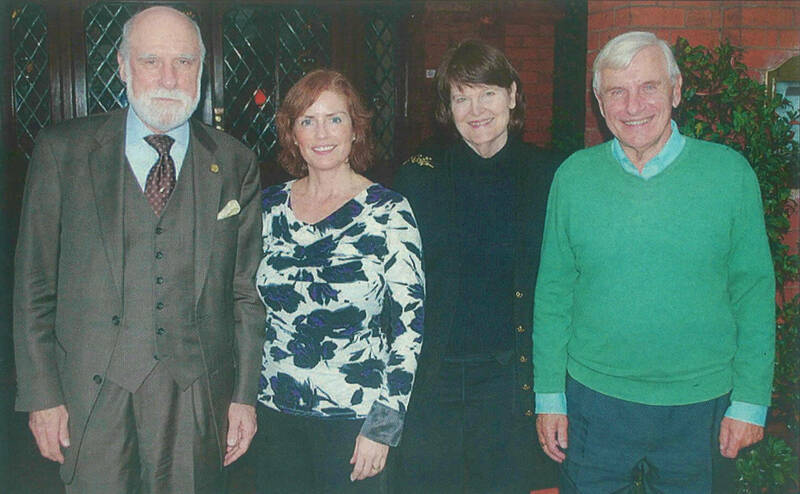 The couple, from Virginia, have been in London since June and stayed at the Red Lion Hotel ahead of a talk at the Henley Business School at the University of Reading’s Whiteknights campus in Reading. Mr Cerf spoke about where the internet is going and the technology behind it as well as its impact on the deaf community. He said he had done a lot of work to help disabled people through his work at Google, from providing free advertising to non-profit organisations to providing an accessible interface. Google Hangouts provides a group video chat platform, where users can communicate in sign language, while Google Glass is a wearable computer with an optical head-mounted display. Mr Cerf says this could be used in the future to allow deaf people to interpret speech. The company has also produced self-driving cars with a dozen already successfully tested in San Francisco. Mr Carter, whose daughter Dawn is deaf, says hearing technology has advanced significantly in recent times but does not restore hearing completely. He says three babies are born deaf in the UK every day and one-sixth of the population has some form of hearing loss. Mr Carter’s wife Helen Lansdown is chief executive of the charity. Mr Carter remains director of the research and development unit, which is based at the Institute of Education at the University of Reading, as well as the Computer Science Department at Goldsmiths College, University of London. Mr Carter was also responsible for setting up the Breakthrough Deaf-Hearing Integration Trust, now called DeafPlus, as well as AACT for Children, Decibels and Inclusive Environments. He was elected a Fellow of the Royal Society of Medicine for his contribution to preventative medicine and healthcare. In 2009, he was awarded an honorary degree by Loughborough University, where he had played fly-half for the first XV, which included 10 internationals. Mr Carter also attended Millfield School on a sports scholarship and later enlisted in the Royal Marines for his national service.